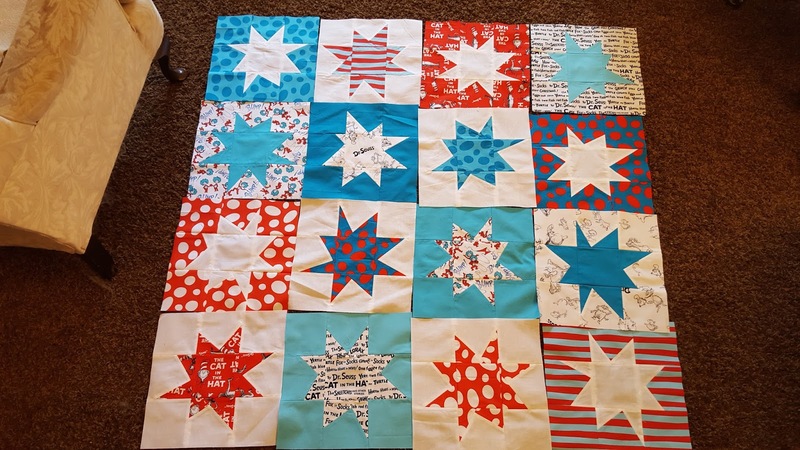 To review, I started three projects this year in the sewing department: Mercy's quilt, the #mightylucky quilting club, and Dr. Seuss wonky stars. 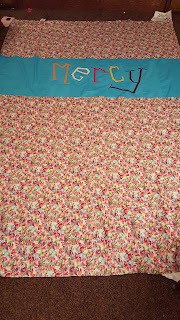 I am really pleased to say that I not only finished Mercy's quilt top, but I also finished the back! I am amazed at how fast it came together and I still can't get over how awesome it looks. The pattern is wonderful, and I really want to make another one for my bed. Maybe some time, but not right now. One of the rows, I really liked the curves so close together. 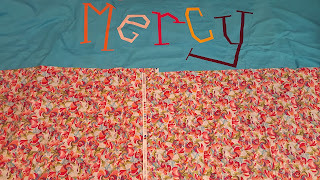 The colors from the front with the color that will be the background for Mercy's name. The background color is from the main quilt backing fabric. Here you can see Mercy's name panel. I really wanted to do something with serifs, so I looked up a bunch of different fonts and picked one that I liked. Then I used that as a guide for how I would make each letter look. Needless to say, the letters don't look much like the font, but it still gave me ideas on where and how to make the serifs and how big to make the letters. I really love how wonky these letters are. A close up of the main backing fabric. I don't think I could have found a more perfect fabric! I didn't do anything for the Mighty Lucky Quilting Club this month. 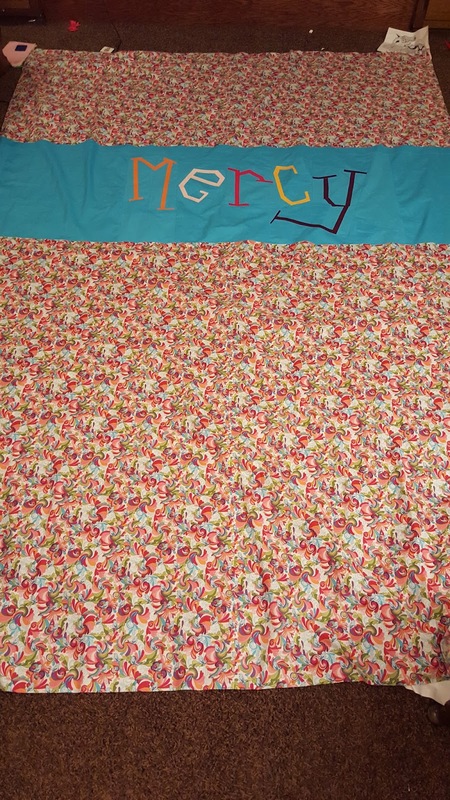 I was really hoping to finish Mercy's quilt in time for her birthday, so I focused on that completely until I couldn't do any more on my own. (Technically I could have basted it on my own, but I didn't want to!) 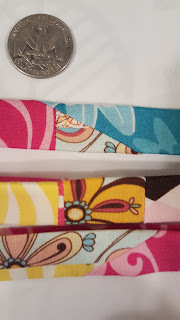 I put together some fabric at the beginning of March for February's challenge, and hopefully I can do February's and March's in March and get caught up. 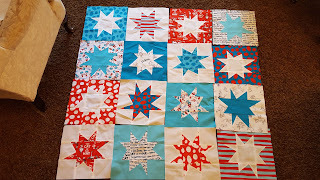 I did make some wonky stars while I was sick and couldn't baste Mercy's quilt. The stars came together so quickly that I just kept making more and more! Before I knew it, all sixteen were finished. I had been planning to leave the quilt top like this, but I had some small pieces left over. I thought I'd use them on the back, but I changed my mind and decided to make a piano key border. I don't want to waste any of this fabric, so I'm excited about the idea for the border, though it will add a bit of time before the top is complete. In addition to all that sewing, Megan and I completed two small quilt tops and backs during our Thursday sewing time. We each took one home to quilt and now all that is left for each is to sew on the binding. A friend took this picture of me while I was sewing at the church. Patrick had been fussy, so he was in the backpack. He likes to be there, and I like being able to get things done while having him close. This little pink quilt was made and basted all in one day. I had all the strips of fabric prepared from making two other quilts with these fabrics. 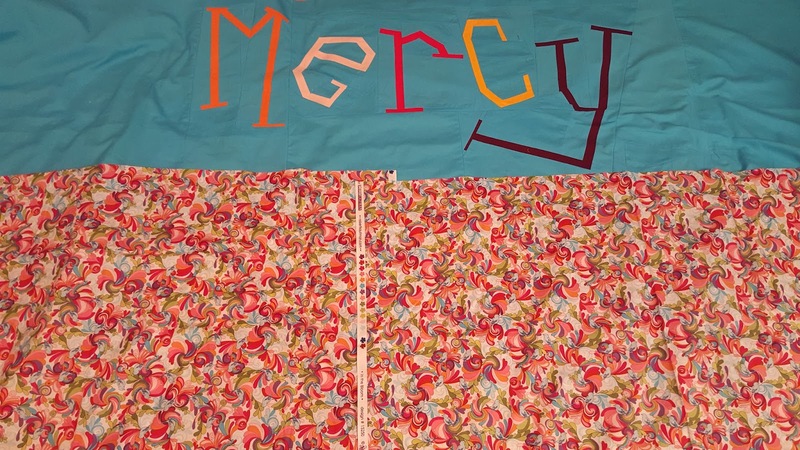 The first quilt with these fabrics was Mercy's baby quilt. We also make the binding on the same day! Preparing to baste quilt number 1. The binding for this little pink quilt is VERY scrappy. Check out how small some of these pieces are! The finished binding for the little pink quilt. This little quilt was made from leftovers from Kyle's bed size quilt. I love the fabric line because it has gears, circuit boards, flying cars, and robots. This quilt took longer to put together because we didn't have a lot of any fabric, so we had to piece lots of bits to make each block and then we wanted to make it asymmetrical, so we added more bits to each grouping and sewed them together into the top. You can see how many little pieces there are in this section of the quilt. The two little quilts together, waiting to be quilted. Megan and I were both quilting them at the church when my sewing machine broke! Fortunately, my handy husband was able to fix it a couple of days later, and it back to working again. An close up of the quiling. Loops seems fitting with the trail from the flying cars.